Here are a few chicken coop ideas you can use for your own backyard chickens or small commercial flock. We've also included chicken coop plans that we have researched, that you can buy to build your own coop. Lets talk about what a coop is supposed to do,and the factors affecting your choice of a coop. This may help you decide which coop you will use for your own birds. What should your chicken coop do? Confinement and control of the chickens means you need to be able to secure them in the coop. This might be for protection at night, or to make sure the hens lay eggs where they are supposed to. Note that confinement and control also means you are keeping the birds OUT of areas where you don't want them, like your garden patch; a few hens can scratch the heck out of your garden in surprisingly little time. Shelter from the elements means protection from precipitation (both rain and snow), shelter from too much sun, and protection from strong winds. Fully-grown and feathered birds are pretty cold-hardy; it's these other factors that can affect them. Your coop should be draft-free and drip-proof, and also provide shade if you raise birds in the hot summer sun. Protection against predators means keeping your birds safe from both domestic and wild marauders. The family dog (or a neighbour's dog) can be just as big a threat to your chickens as a fox or raccoon. So your coop must be secure against these invaders. Beyond these basics, if you are raising laying hens your chicken coop will also need nest boxes for egg laying, and poles for roosting. Nest boxes can be simply built of 1" thick dimensional lumber. Laying hens should also have a pole for roosting. We have made roosts from 2" (5 cm) cedar poles, and also from 2"x 2" lumber with the edges rounded. As well as the features of the coop itself, you need to consider where the coop will be situated. One of your first decisions will be building (or buying) a permanent coop or a portable coop. If you choose a permanent location for your birds, the first option to consider is retrofitting an existing structure to house your birds. If you have an existing shed or outbuilding that is weather-tight, and where convenient access to an outdoor chicken yard can be provided, this may be the easiest (and cheapest) chicken coop idea. Two of our coops for our laying hens were created by partitioning existing buildings on our farm. If you don't have an existing structure, you can build a permanent coop in a suitable location. Site factors to consider include: easy access to the coop for chicken care and cleaning, convenient access to water, shelter from prevailing winds and storms, and the 'visibility' of the coop to your neighbours. You also want to be able to store chicken feed and bedding material nearby. Small portable chicken coops have fewer factors to consider, since they can be moved if a location proves unsuitable. The portable coop will probably house fewer birds; this may be OK if you just want a few hens for fresh eggs. And the portable coop may be less visible to the neighbours. However, with this chicken coop idea you will need to provide separate storage for feed and bedding. Chicken coop ideas for meat birds involve different factors than raising laying hens. Obviously your coop won't need nest boxes. And we don't provide roosts for meat birds; the act of roosting can cause damage to the breast area of the bird. This means your coop can be simpler and lighter; they still must provide shelter and predator protection, but portable coops for meat birds can be quite simple to construct. 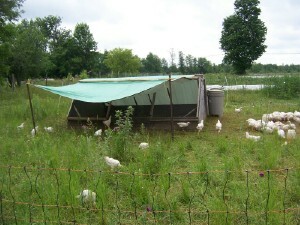 Portable coops for meat birds tend to fall into one of two categories; the 'chicken tractor' type, or the 'movable coop' type. In the chicken tractor model, one of the well known chicken coop ideas as popularized by Andy Lee and Joel Salatin, meat birds are raised in covered, open-bottomed cages, usually constructed of light lumber and chicken wire. The chicken tractors are dragged to fresh ground each day, allowing the birds access to fresh pasture through the open bottom. We have tested a number of chicken coop ideas over the years we have been raising chickens for the freezer and for sale. We started out using chicken tractors, but found them unsuitable to our location and conditions. We now use a type of movable coop which is a larger but still portable structure. The meat birds are only confined in the coop at night; during the day, they roam around a yard that is fenced with portable electric netting, to keep the birds in and the bad guys out. Our coop is 8' x 12', easily movable by one person with a hand truck, and houses 100 birds. Since the birds only go into the coop at night, less space per bird is needed. Each week we move the portable coop and the Electronet fencing to a fresh patch of ground. Since we have used this method, our losses have been very low, usually less than 5%. Our 8'x 12' portable coop costs about $150 to construct, making it a cheaper chicken coop idea than most.